The Hawthorne String Quartet, comprised of members of the Boston Symphony Orchestra, will be in residence in Syracuse from Jan. 22-25 for a series of events to promote Holocaust education and public memory. One of the highlights of the quartet’s visit will be the “Promise of Hope” concert with Symphoria on Jan. 24 at 7:30 pm at the Crouse Hinds Theater in the John H. Mulroy Civic Center. And the public is invited to a free concert on Sunday, Jan. 25, at 1 p.m. in the Joyce Hergenhan Auditorium, Newhouse 3, Syracuse University. Sunday’s concert event will feature Berkshire-based landscape artist and Syracuse University alum Jim Schantz (VPA ’77), who will paint as the Quartet plays “String Quartet (1921)” by Hans Krása. The concert is free and open to the public. Reserved seating is available by calling 315-443-4754 or email arflanag@syr.edu. Free parking for the concert will be available in the Waverly parking lot. While the quartet is in residence, its members will give a concert preview and host a discussion at Temple Concord on Jan. 22, and perform a program at Westhill High School on Jan. 23. For nearly 10 years the School of Education has been providing programs to enhance education and public memory about the Holocaust and genocide through programs for students, professional development workshops for teachers, interdisciplinary university symposia, and lectures and cultural events for the community. Learn more about upcoming events at http://teachingtheholocaust.org. 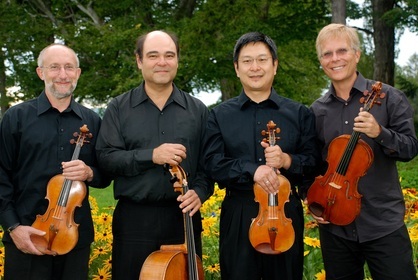 In partnership with the Holocaust and genocide education programs at Syracuse, the Hawthorne String Quartet’s residency is sponsored by The Ziering Family Foundation of Los Angeles.